Middle school stoles are frequently worn by middle school students to their graduation ceremonies. Gradshop offers an extensive color selection. 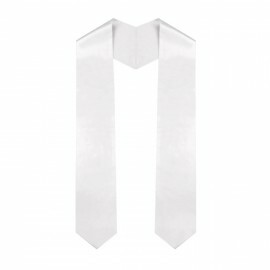 You can be rest assured our stoles are made of high quality bridal satin, popular tip style, shaped to fit all body types, fully lined throughout, and individually packaged. These stoles will add that final touch of perfection to your middle school cap, gown, and tassel package. Gradshop.com is confident you will find the perfect color stole in our vast selection. We want you to hold your head high when walking across the stage wearing our graduation apparel and accessories. These premium stoles provide the finishing touch by making your middle school graduation memorable. Gradshop's wide range of middle school graduation accessories is sure to match your every need. Combining top quality, style and craftsmanship with astonishingly cheap pricing, Gradshop's graduation stoles are certain to be your number one choice. They may be purchased separately or purchased in large quantities to receive huge bulk discounts. Get in touch with us right now!